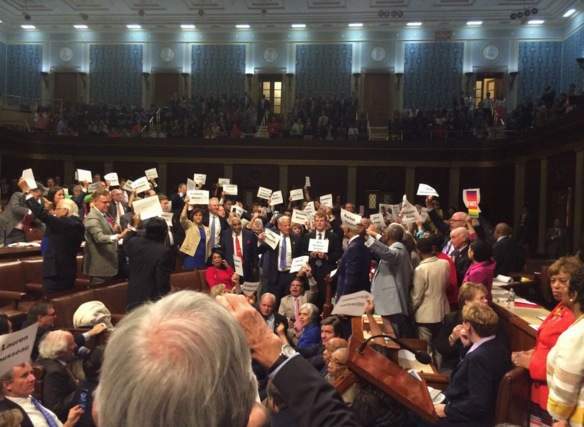 Democrats protesting on the House floor. CONGRESS | Alameda County’s three members of the House of Representatives had starring roles in the historic protest by Democrats on the House floor Wednesday urging for votes on a pair of gun-related bills. Reps. Barbara Lee, Mike Honda and Eric Swalwell all spent the duration of the nearly day-long (still going) sit-in listening to colleagues rail against gun violence, while giving their own addresses. Labeled on social as #NoBillNoBreak, the protest by Democrats was not televised by C-SPAN after Republican House Speaker Paul Ryan called for a recess. Microphones on the House floor were also turned off. Swalwell, one of the youngest members of Congress, and a noted social media maven, naturally acted as one of a handful of representatives who utilized Periscope, a burgeoning livestreaming app, to broadcast the protest around the nation and world. Lee, who represents Oakland, one of the cities hit hardest by gun violence, carried a photo of 16-year-old Reggina Jefferies, who was shot and killed last week. “I also have pictures of other young people killed in my district,” Lee added. Posted in Alameda County, Barbara Lee, CA15, CA17, congress, Eric Swalwell, gun violence, guns, House Democrats, House Republicans, Mike Honda, NoBillNoBreak, paul ryan, Periscope, protests. Bookmark the permalink. Gotta love good political theater! I question the motive of a few of these lawmakers who are obviously trying to gain political points with voters, especially in the case of Mike Honda who shamelessly sent out a fundraising email this morning leveraging this political stunt. Desperate times calls for desperate measures. Of the approx 2.2 million deaths that occur every year in the US, approx thirty thousand people are shot to death every year, AND APPROX TWO THIRDS OF THOSE 30K ARE SUICIDES, so my viewpoint is that if not even one of those approx 10K situations in which a person shot someone else to death was justifiable homicide, therefore at most only about one half of one percent of all the deaths in the US can be considered to be murders resulting from gun violence. However of the approx 2.2 million deaths that occur every year in the US, a considerable percentage of them, in other words hundreds of thousands, are premature deaths from such things as strokes, heart attacks, and lung cancer, etc, caused by toxic hazards, and such as asbestos situations, etc, that are often covered up by crooked lawyers and the corrupt judges those crooked lawyers pay under the table bribes to. Still furthermore, even the very most conservative estimates of the number of people who die every year in the US of hospital acquired infections is over 100K. And obviously if a whistleblower tries to bring to light the truth about improper sanitation practices in a particular hospital, almost certainly the hospital will hire the very sleaziest lawyers it can find to harass the whistleblower and try to destroy him in a financial battle of attrition, and then will finally get a corrupt judge to seal the case, and so that the general public will never find out the truth. However since an extremely high percentage of the very highest ranking members of the Democratic Party are lawyers and/or have close family members who are lawyers, and including the Clintons, the Obamas, Joe Biden, Willie Brown, Dianne Feinstein's daughter, at least one of Pelosi's children, and Barbara Boxer's husband and son, etc, etc, etc, therefore the scam artists, parasites, and blood sucking leeches who run the DP want to distract the general public from the very biggest and most serious threats to health and life, and which are not guns, but are demagogue and charlatan politicians, sleazy lawyers, and the corrupt judges who take under the table bribes from those sleazy lawyers.